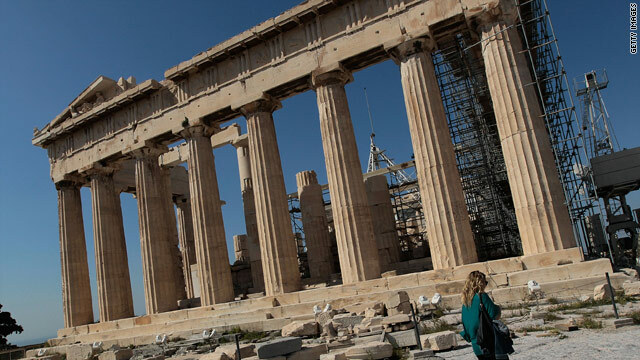 Can Europe paper over Greek cracks? The rescue plan for Greece involves funds from both Europe and the International Monetary Fund. Lake Como, Italy (CNN) -- It is an event, like Davos, known more by its location name than anything else. The European House/Ambrosetti Financial Workshop has been a discreet but respected venue for two decades, held on the cusp of spring in Cernobbio on Lake Como. The event attracts about 150 leading Italian industrialists who rub elbows with a handful of European finance ministers, top strategists and a few current and former central bankers. The timing was ideal to take the pulse of the deal cobbled together with some frayed nerves in Brussels on the eve of this workshop. It was abundantly clear in interviews with the finance ministers of France, Spain, Poland and with European Central Bank member Lorenzo Bini Smaghi that the European Union this time picked a road that was paved entirely by Germany and its determined Chancellor Angela Merkel. Twenty four hours before we convened in the industrial north of Italy, Bini Smaghi and his boss Jean Claude Trichet declared bringing the IMF into European play would be a "failure" for monetary union and that a European solution must be found. By the time events began to unfold in Cernobbio, they were singing from the same hymn sheet, but it was clear none was too pleased with what was handed to them. Two other power women of European finance, Christine Lagarde of France and Elena Salgado of Spain talked now of a working framework to make convergence a reality. The reason Europe became part of the Greek tragedy is that after ten years of a single currency the economies of the core euro zone Germany, France and maybe Italy have very little in common with say Greece and Portugal. The euro has made the citizens of Athens and Lisbon feel wealthier, but their governments have fallen well short on the reform of labor laws and defining a unique selling proposition for their economies beyond tourism receipts. Once the real estate boom came to an end, cracks in the foundation of the southern med countries became fault lines. Nearly all the discussion in Cernobbio -- whether in the workshop, on the sidelines or over dinner -- revolved around how Europe picks up the pieces from here. One finance minister outside the euro zone noted in a whispering tone that the strong arm tactics of 16 countries of the zone drafting a communiqué for all 27 European members does not work. "Nearly all the discussion in Cernobbio -- whether in the workshop, on the sidelines or over dinner -- revolved around how Europe picks up the pieces from here. That is as close to a two-speed Europe as one can get and will define the have and have nots if left unchecked. In this case objections by Britain and Poland to the term European "government" rather than European "governance" and some other clauses are not minor. Many dislike the new European president making a power play to be the new traffic cop of economic rigor by the member states. One would have thought the ECB would be a good place to start or the European Commission which is home to the current Eurostat -- the agency not given the power to police Greek budgets for the past decade. Curiously left out of most of the debate is the pain that will be inflicted in the med countries over the next four years as they try to take double digit budget deficits back down to the Maastricht criteria levels of three percent. Keep an eye on Greece, Portugal and Spain. Finance Minister Salgado rightly pointed out that Spain is not only a much larger economy, but benefits from a stable core of Spanish global companies on the IBEX stock index and a debt to GDP that is about 20 percent below the European average. Greece and Portugal both have debt levels in the triple digits, i.e. over 100 percent. As we departed the waterfront venue on Lake Como, storm clouds lifted to welcome spring. Let's hope that the stormy, drawn out debate about whether the IMF should be part of the solution is over, clearing the way for policies that not only fend off speculators but more importantly can make the block more responsive to its nearly half billion citizens.